Argentum Class Frigate - A brief overview. 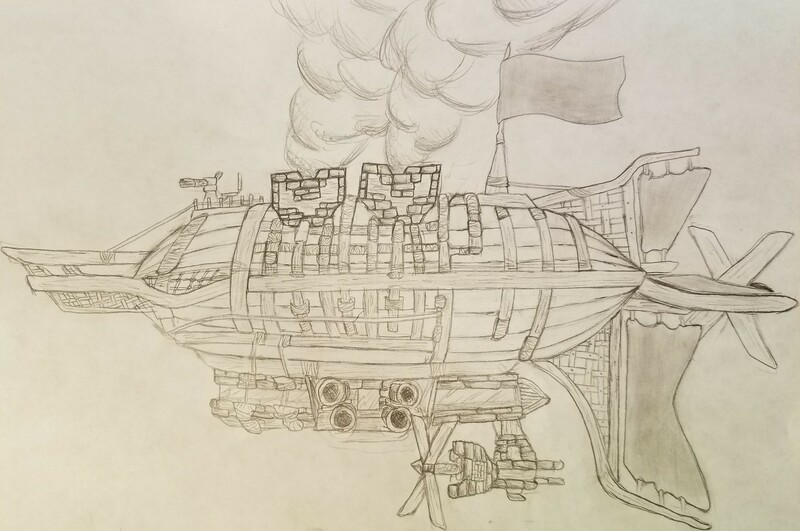 Commissioned on the 341st day of Timberfall, 422 ACE, in response to the escalating tensions following the failed Yukrovian summit, The Cyclosian Engineering Yard’s Argentum class frigate was designed as a multi role ship. At a length of 79 meters, the ship was presented a relatively large cross-section compared to other frigates of its time. To make up for its size, the ship was equipped with two standard quad-pneumatic coulumbaids, two standard Mark III CEY bullfrog heavy engines, and one Mark II CEY mollusk industrial engine which gave this ship the firepower and speed to be more than a match for any frigate currently fielded by any other nation. In addition, a forward-mounting point on top of the balloon allowed for a medium weapon such as a harpoon gun, pneumatic repeater, or gas mortar to be fitted to the ship. Although commissioned before the infamous War of Lies, these ships would fail to see action as resources were transferred away from the project to forward the growing war effort. Following the abrupt disappearance of the leaders of the ETP, and the nation's subsequent decline, resources were once more allocated to the production of Argentum class frigates. The first few units were set to leave dry dock on the 370th day of Cryos, 430 ACE with the goal of having them crewed and combat operational by the 82nd day of Evermoon the following year. Until then, they were temporarily set to act as a defensive bulwark against what seemed like the inevitable tide of chaos rising around Aureus.